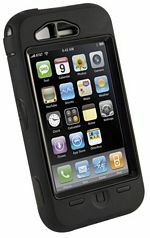 Love that new iPhone® 3G/3GS and can't live without it? Protect it from potential mishaps with an OtterBox Defender Series case. Enclose your device in the highest quality, toughest case available. Every feature of your device is fully accessible while it is completely encased in rugged protection. Defender Series cases have an innovative three layer design that protects your iPhone from bumps, drops, scratches and dust while keeping your iPhone fresh as new. This case will not fit the 1st Generation iPhone or iPhone 4!